Most people have 24 vertebra in their spine, and each vertebra has 2 facet joints, one on each side. 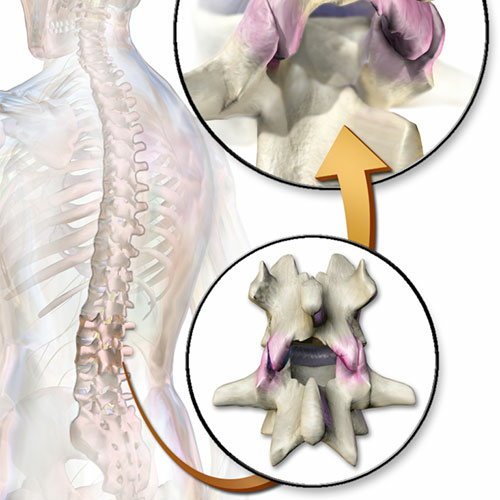 These joints allow for motion to be achieved at each vertebra and allows for gliding motion to occur. When a condition such as arthritis interferes with these joints, that motion is hampered. Pain, lack of flexion and further deterioration occurs, so sometimes facet replacement is recommended. Facet replacement refers to the surgical replacement of a facet joint for the treatment of facet joint degeneration. Facet joints are the stabilizing joint structures that connect vertebrae (the small bones of the spine) to one another. What causes facet joint degeneration? Facet joint degeneration is typically preceded by the degeneration of intervertebral disks, the layers of cartilage that separate the vertebrae of the spine. As disks decrease in height, ligaments and soft tissue around the disks become altered. When that occurs, forces on the facet joints are increased, which eventually causes the joints to degenerate as well. How is facet joint degeneration treated? Historically, few options for the treatment of facet joint degeneration have existed. Medication, facet joint blocks (injections of local anesthetic), and facet rhizotomy (a procedure that severs nerve roots in the spinal cord) have been used to decrease facet inflammation and its accompanying pain. After failure of these procedures, treatment has historically been limited to spinal fusion (the welding together of the vertebrae); and although fusion is reliable, it can frequently lead to other problems. In recent years, however, interest in facet joint replacement as a potential treatment for facet joint degeneration has developed. In response, a number of new technologies for the replacement of facet joints have been introduced. What occurs when a facet joint is replaced? Facet joints are replaced in a surgical procedure that removes a diseased or dysfunctional joint, which is then replaced with an artificial, prosthetic implant. Potentially, the procedure delivers pain relief and nerve decompression as well as improved spine stability. Additionally – similar to hip and knee replacement surgeries and unlike traditional approaches such as spinal fusion – facet joint replacement is intended to preserve normal spine structure, and to maintain full mobility and motion. What is the prognosis of facet joint replacement? Many of the technologies and devices used for facet joint replacement are new and still being evaluated in clinical trials. As a result, data regarding the prognosis of this surgical procedure are still to be determined. If you suffer from debilitating chronic pain due to arthritis or injury of your facet joints, consult with one of the spine specialists at the Florida Spine Institute, who may help you regain movement and functionality with a facet replacement. A pivotal study of a facet replacement system to treat spinal stenosis. ClinicalTrials.gov. Available at: https://clinicaltrials.gov/ct2/show/NCT00401518. Last accessed December 26, 2014. Henderson C, Asdourian PL. in Arthritis and Arthroplasty: The spine. Editors: Shen FH, Shaffrey CI. Elsevier Health Sciences, 2010.